Little quiz for you - guess who made these pretties? They have a nice take on the ubiquitous bow - a sort of undone, tucked in, I-made-a-bit-of-an-effort-to-tie-a-bow-but-I'll-be-late-for-cocktails kinda loop. The heel is a good height and solid enough to feel stable while the platform means it won't feel quite so high. 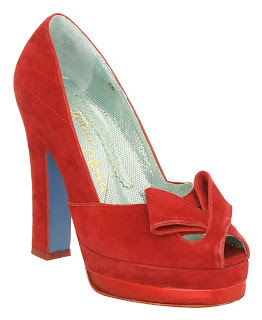 Throw in a peep toe and some autumnal dark red suede and these, dear reader, are shoes to covet then purchase.